CVOO stands for Cape Verde Ocean Observatory. Observation is fundamental to understanding global climate change. Atmospheric change impacts marine ecosystems, and the atmosphere is influenced by ocean physical and biogeochemical processes. Many impacts/feedbacks are focused in the Tropics. 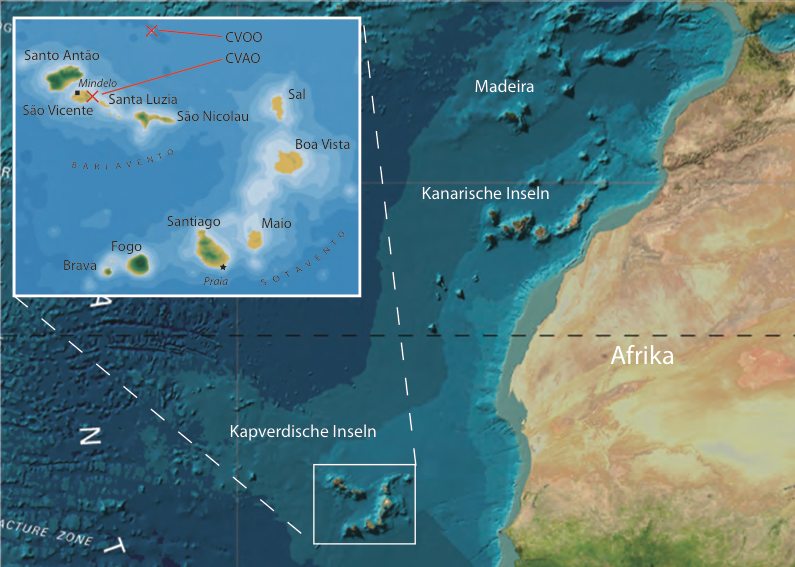 CVOO is part of the Cape Verde Observatory (17.6°N 24.3°W) which consists of operational atmosphere and ocean monitoring sites for various climate-relevant environmental parameters in the tropical Eastern North Atlantic Ocean. The entire region, as many tropical areas, is data poor but plays a key role in air-sea interaction. Cape Verde is ideally located for both ocean and atmosphere observation. Being downwind of the Mauritanian upwelling, the Observatory will provide unique information linking biological productivity and atmospheric composition. The location is critical for climate and greenhouse gas studies and for investigating dust impacts on marine ecosystems. The co-location of ocean and atmospheric Observatories is unique. Additionally, this Action supports transfer of European technology/expertise to a developing country with strong ties to Europe. The ocean site measures temperature, salinity, biological parameters, nutrients, dissolved carbon and oxygen, and include an oceanographic long-term mooring for in-situ observations. Cape Verdean research vessel Islândia is equipped with state of the art instruments to collect samples for marine parameters. Novel observational platforms such as gliders or profiling floats are used within the framework of various field studies at CVOO. Collected data is set into context of observations at the atmospheric site (CVAO) which measures meteorological parameters, greenhouse and short-lived gases, and aerosols. Linked data between both observatories provides highly valuable information about processes at the ocean-atmosphere interface. Science logistic bases are quite common for the study of high-latitude processes (e.g. sites in Svalbard, Canada, Antarctica as well as sub-tropical sites such as Bermuda and Hawaii), but there is a severe lack in critical tropical regions, including West Africa. CVOO provides in this region logistical support for international research campaigns and projects and therefore bringing the benefits of this research infrastructure to the attention of the international scientific community. CVOO highly welcomes international investigators to conduct field work in the West African region.